To Cite: Lotfi M, Azizi M, Tahmasebi W, Bashiri P. Investigation of Six-Week Beetroot Juice Ingestion on VO2max in Female Soccer Players, Zahedan J Res Med Sci. 2019 ; 21(1):e86250. doi: 10.5812/zjrms.86250. Background: One of the beverages improving athletic performance is beetroot juice. Objectives: The aim of the present study was to investigate if six weeks of beetroot juice ingestion can increase VO2max and improve the performance of female soccer players. 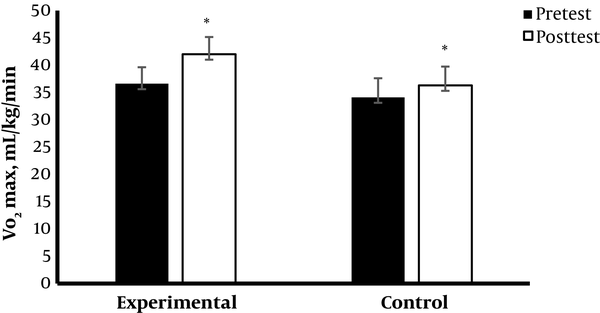 Methods: 20 female soccer players (age: 23.13 ± 0.77 years) were selected and assigned into two groups: experimental (beetroot juice, n = 10) and control (placebo, n = 10). The Bruce test was first done to assess VO2max without drinking beetroot juice. Then, the experimental group started consuming 200 mL of the juice two hours before each training session for six weeks. Finally, the second Bruce test was performed after six weeks of beetroot juice ingestion. Results: There was a significant increase in VO2max in the experimental and control groups from pretest to posttest (P < 0.001). In addition, the results of independent samples t-test showed there was a significant difference between the experimental and control groups in VO2max (P < 0.001, t = 12.39). Conclusions: The present study provides evidence that beetroot juice positively affects performance and increases the maximum volume of oxygen consumption in female soccer players. Therefore, we can propose this juice to female soccer players to improve their performance. Soccer is a strength and power-contact sport that includes high-intensity activity, training, and competition (1). Physiological, technical, and tactical skills are important for soccer performance. Factors such as acceleration, speed, jump height, and energy release capacity are of most importance in soccer. Due to the duration of a soccer match, 90% of the energy release is aerobic. The aerobic endurance performance in soccer depends on three factors: maximal oxygen consumption (VO2max), anaerobic threshold, and work economy (2). It is known that the distance covered in high intensity and speed is more in men than in women (3), which is due to the low VO2max and the anaerobic power of female soccer players (4). Athletic performance is one of the issues to which soccer players attend. They use various supplementations to increase their performance. Although supplements may temporarily improve their athletic performance, their long-term use will increase the damage to the blood, kidneys, and liver. A notable factor of performance is the maximal oxygen uptake (VO2max). VO2max measures the maximum amount of oxygen consumed by the body per minute that is typically expressed in mL/kg/min. The higher the VO2max value produced by an individual, the greater the rate of oxygen consumption by the athlete’s body and the higher the level of fitness. Minor increases in VO2max can have remarkable advantages, especially in team sports. For example, some researchers speculate that if every player in a soccer team has a VO2max of just 6 mL/kg/min higher than the opponent has, the aerobic capability possessed would equate essentially having an additional player in the field (5). VO2max can be increased in an individual over time by participating in different types of endurance training programs (6). The advantage of a higher VO2max is that there is a greater delivery of oxygen from the blood to the muscle tissues, so athletes may work at a higher intensity for a longer time. Increased blood flow is attributed mostly to increased cardiac output, but also to the muscle pump and local mediation of vasodilation near the muscle tissue. This occurs as a natural response to exercise and can increase blood flow exponentially compared to resting values (7). Focusing on vasodilation, several sources have suggested that nitric oxide be a prime solicitor in the process. This vasodilation occurs as nitric oxide (NO) relaxes the vascular smooth muscle (8, 9). NO is a very labile free-radical gas produced by cells that, although commonly known to be used to reduce blood pressure, serves many other purposes including vascular diameter regulation, blood flow mediation, mitochondrial respiration, platelet function, and neuronal communication. NO is not ingested directly; rather, it is derived from substances endogenously manufactured or ingested via dietary or supplemental means. L-arginine, L-citrulline, sodium nitrate, and beetroot supplement appear to be the most popular ones (10). Beetroot (Beta vulgaris L.) is one the vegetables that contains micronutrients including potassium, betaine, sodium, magnesium, vitamin C, and nitrate (NO3) (1). Beetroot also has lots of nitrates (more than 250 mg per 100 g of fresh beetroot). Increased nitrate availability may increase oxygen and nutrient delivery to active muscles and thereby, lower the ATP cost of muscle force production and improve physiological responses related to endurance performance and recovery (10). Nitrate can be reduced to nitrite through the bacteria present in the mouth and by certain enzymes in tissues (e.g., xanthine oxidase). Part of absorbed nitrite in the acidic environment of the stomach is converted to nitric oxide, but a significant amount of it enters the systemic circulation to increase nitrite in plasma. A number of enzymes and proteins, including deoxyhemoglobin, can convert nitrite to nitric oxide by taking an electron from nitrite in the blood and tissues, which is facilitated by oxygen deficiency (ischemia and hypoxia) and low pH. Interestingly, these conditions may exist in skeletal muscles during exercise (11). Based on this information, using beetroot juice may be a way for increasing VO2max and performance in female soccer players. The aim of the study was to investigate if beetroot juice can increase VO2max and improve the performance of female soccer players. The statistical population included 50 female soccer players (N = 50) who were performing three sessions of high-intensity soccer training per week. After the announcement of the study, the subjects (n = 20, age = 23.13 ± 0.77 years) interested take part in the study. Written consent was obtained from the subjects after being informed about the purpose of the study. Then, they were divided randomly into two groups (experimental, n = 10) and (control, n = 10). The protocol was approved by the ethics committee of the faculty of sports sciences at Razi University. Height, weight, BMI, and VO2max were obtained in the first session. Then, the subjects started with either the ingestion of 200 mL of beetroot juice or an equal amount of placebo (water, carmoisine food color, and stevia) two hours before starting their training for six weeks (18 sessions) (12). They were asked to continue their current training programs throughout the study. In the last session, the second Bruce test was done and VO2max was evaluated in the pretest and posttest. Height, weight, and BMI were assessed in details. These data are shown in Table 1. The routine training included a combination of offensive and defensive training three times per week for 90 min supervised by a coach. We used the Bruce test for estimating aerobic power and predicting VO2max. The ﬁrst Bruce test was done to assess VO2max in female soccer players without drinking (beetroot juice or placebo). The second Bruce test was done after six weeks of beetroot juice ingestion. VO2max was measured on a treadmill (HP Cosmos) using respiratory gas discharge (Cortex Metalyzer 3B and Cortex Metamax 3B) in the Bruce test. Figure 1 shows the VO2max levels of subjects in the experimental and control groups. Data were reported as means and standard deviations (mean ± SD). Changes in VO2max over the six-week period were assessed by paired samples t-test and independent samples t-test. Statistical signiﬁcance was deﬁned as P < 0.05. The statistical analyses were performed using statistical package for social sciences (SPSS version 22). The results of analyzing data are shown in Tables 2 and 3. The mean ± standard deviation (SD) value of VO2max before the consumption of beetroot juice was 36.60 ± 3.02 and after six weeks of beetroot juice consumption, it reached 42 ± 3.16. In the control group, the mean ± standard deviation (SD) value of VO2max before six weeks of soccer training was 34.10 ± 3.51 that increased to 36.30 ± 3.43 after six weeks of soccer training. In both groups, we observed a significant increase in VO2max (P < 0.001). The findings unfolded that the overall difference in the mean score of VO2max between the experimental and control groups was 3.20 with an SD of 0.258. It showed that after the administration of beetroot juice, there was a highly significant improvement in the VO2max level of female soccer players with a t value of 12.39 at P < 0.001. The presence of nitrate in beetroot juice has attracted the attention of many researchers to this drink. However, there are contradictory results in various sports fields. There are studies that evaluated the effects of beetroot juice consumption on the athletic performance. Nevertheless, similar studies have not been carried out in female soccer players. This is the first study that examined the effect of six weeks of beetroot juice ingestion on VO2max in female soccer players. Boorsma et al. examined the impact of beetroot juice consumption on the performance of 1500-m elite runners. Acute (one session) and chronic (eight sessions) consumption of (210 mL) beetroot juice (containing 19.5 mmol nitrates) did not increase the performance, which is inconsistent with the results of the current study (13). Lowings et al. examined the effects of beetroot juice consumption on the performance of trained swimmers. They showed that beetroot juice consumption although increased nitric oxide levels in the blood, it did not improve the performance, which is inconsistent with the results of the current research (14). Wylie et al. examined the effects of five-day beetroot juice consumption on the performance of male soccer players. The results showed that beetroot juice consumption improved the performance and it might be an ergogenic aid for soccer players, which is consistent with the results of the present study (15). Kashania et al. evaluated the effects of five days of beetroot juice consumption on VO2max in male soccer players. Their research indicated that there was a positive impact for beetroot juice on performance. In fact, VO2max significantly increased in soccer players. This finding is consistent with the results of the present study (1). The main original ﬁnding of the study was that the control group had a signiﬁcant increase in VO2max levels that could be related to the soccer training they were performing. VO2max levels signiﬁcantly increased in the experimental group after six weeks of beetroot juice ingestion (P < 0.001), indicating the positive effect of beetroot juice on VO2max. In fact, both groups had a significant increase in VO2max. Nevertheless, the increase in the experimental group was more that could be attributed to the six week-beetroot juice ingestion. This ﬁnding suggests that chronic dietary nitrate intake in the form of beetroot juice be an effective nutritional strategy to improve the performance of athletes in intermittent sports such as soccer. The main VO2max multiplying mechanism of beetroot juice is based on the physiological role of nitrates and its subsequent conversion to NO; NO is a powerful vasodilator, which increases oxygen delivery to active muscles and makes mitochondria to be more effective to generate large amounts of ATP. Increased exposure to NO3− and NO2 has been reported to activate PGC1-α (peroxisome proliferator-activated receptor γ coactivator1-α) (16) and adenosine monophosphate-activated protein kinase (AMPK) (17) in skeletal muscles. These proteins are known to activate signaling cascades that promote adaptive skeletal muscle remodeling to soccer training. It is possible that the NO-mediated signaling cascades generated by beetroot juice are synergistic to molecular signaling processes stimulated by soccer training. By augmenting transcription pathways integral to skeletal muscle remodeling and maintaining higher training intensities, the aforementioned effects are exerted on muscle contractile efﬁciency (18). Based on the effects of six weeks of beetroot juice consumption on improving VO2max and athletic performance of female soccer players, it can be concluded that this beverage is one of the best natural, inexpensive, and safe drinks that we can recommend to female soccer players. They can use this beverage before training or in different bouts of soccer training. The cost of this juice is very low and its consumption has many benefits for the body. In addition, this study provided a basis for interventional studies to generate scientiﬁc knowledge. Further comparative research must be done for discovering the relationship between dose-dependent beetroot juice consumption and athletic performance in both sexes in different levels of soccer training intensity. We would like to thank all participants for their contribution to this research. Ethical Considerations: The protocol was approved by the Ethics Committee of the Faculty of Sports Sciences at Razi University. Patient Consent: Written consent was obtained from the subjects after being informed about the purpose of the study. 1. Kashania S, Nigam S, Bhatnagar B. Effect of consumption of beetroot juice on vo2 max in football players. Int J Sci Res. 2018;7(3). 2. Hoff J, Wisloff U, Engen LC, Kemi OJ, Helgerud J. Soccer specific aerobic endurance training. Br J Sports Med. 2002;36(3):218-21. [PubMed: 12055120]. [PubMed Central: PMC1724499]. 3. Datson N, Hulton A, Andersson H, Lewis T, Weston M, Drust B, et al. Applied physiology of female soccer: An update. Sports Med. 2014;44(9):1225-40. doi: 10.1007/s40279-014-0199-1. [PubMed: 24803162]. 4. Andersson HA, Randers MB, Heiner-Moller A, Krustrup P, Mohr M. Elite female soccer players perform more high-intensity running when playing in international games compared with domestic league games. J Strength Cond Res. 2010;24(4):912-9. doi: 10.1519/JSC.0b013e3181d09f21. [PubMed: 20300037]. 5. Perez JM. The effects of beetroot juice on vo2max and blood pressure during submaximal exercise [dissertation]. Georgia Southern University; 2017. 6. Milanovic Z, Sporis G, Weston M. Effectiveness of high-intensity interval training (HIT) and continuous endurance training for VO2max improvements: A systematic review and meta-analysis of controlled trials. Sports Med. 2015;45(10):1469-81. doi: 10.1007/s40279-015-0365-0. [PubMed: 26243014]. 7. Tschakovsky ME, Shoemaker JK, Hughson RL. Vasodilation and muscle pump contribution to immediate exercise hyperemia. Am J Physiol. 1996;271(4 Pt 2):H1697-701. doi: 10.1152/ajpheart.1996.271.4.H1697. [PubMed: 8897965]. 8. Cosby K, Partovi KS, Crawford JH, Patel RP, Reiter CD, Martyr S, et al. Nitrite reduction to nitric oxide by deoxyhemoglobin vasodilates the human circulation. Nat Med. 2003;9(12):1498-505. doi: 10.1038/nm954. [PubMed: 14595407]. 9. Casey DP, Mohamed EA, Joyner MJ. Role of nitric oxide and adenosine in the onset of vasodilation during dynamic forearm exercise. Eur J Appl Physiol. 2013;113(2):295-303. doi: 10.1007/s00421-012-2439-0. [PubMed: 22692759]. 10. Bescos R, Sureda A, Tur JA, Pons A. The effect of nitric-oxide-related supplements on human performance. Sports Med. 2012;42(2):99-117. doi: 10.2165/11596860-000000000-00000. [PubMed: 22260513]. 11. Ormsbee M, Lox J, Arciero P. Beetroot juice and exercise performance. Nutrit Diet Suppl. 2013:27. doi: 10.2147/nds.s52664. 12. Hoon MW, Jones AM, Johnson NA, Blackwell JR, Broad EM, Lundy B, et al. The effect of variable doses of inorganic nitrate-rich beetroot juice on simulated 2,000-m rowing performance in trained athletes. Int J Sports Physiol Perform. 2014;9(4):615-20. doi: 10.1123/ijspp.2013-0207. [PubMed: 24085341]. 13. Boorsma RK, Whitfield J, Spriet LL. Beetroot juice supplementation does not improve performance of elite 1500-m runners. Med Sci Sports Exerc. 2014;46(12):2326-34. doi: 10.1249/MSS.0000000000000364. [PubMed: 24781895]. 14. Lowings S, Shannon OM, Deighton K, Matu J, Barlow MJ. Effect of dietary nitrate supplementation on swimming performance in trained swimmers. Int J Sport Nutr Exerc Metab. 2017;27(4):377-84. doi: 10.1123/ijsnem.2016-0251. [PubMed: 28182502]. 15. Wylie LJ, Mohr M, Krustrup P, Jackman SR, Ermiotadis G, Kelly J, et al. Dietary nitrate supplementation improves team sport-specific intense intermittent exercise performance. Eur J Appl Physiol. 2013;113(7):1673-84. doi: 10.1007/s00421-013-2589-8. [PubMed: 23370859]. 16. Roberts LD, Ashmore T, McNally BD, Murfitt SA, Fernandez BO, Feelisch M, et al. Inorganic nitrate mimics exercise-stimulated muscular fiber-type switching and myokine and gamma-aminobutyric acid release. Diabetes. 2017;66(3):674-88. doi: 10.2337/db16-0843. [PubMed: 28028076]. 17. Mo L, Wang Y, Geary L, Corey C, Alef MJ, Beer-Stolz D, et al. Nitrite activates AMP kinase to stimulate mitochondrial biogenesis independent of soluble guanylate cyclase. Free Radic Biol Med. 2012;53(7):1440-50. doi: 10.1016/j.freeradbiomed.2012.07.080. [PubMed: 22892143]. [PubMed Central: PMC3477807]. 18. Bailey SJ, Fulford J, Vanhatalo A, Winyard PG, Blackwell JR, DiMenna FJ, et al. Dietary nitrate supplementation enhances muscle contractile efficiency during knee-extensor exercise in humans. J Appl Physiol (1985). 2010;109(1):135-48. doi: 10.1152/japplphysiol.00046.2010. [PubMed: 20466802].